The rescued boaters on the Coast Guard vessel. 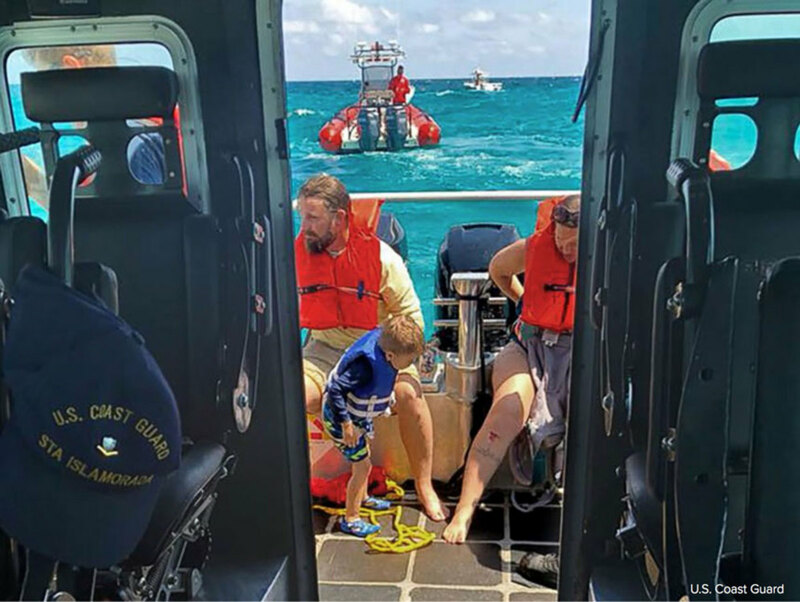 Two teenagers helped rescue six people, including a 4-year-old and a 3-month-old, from the water in the Florida Keys after their boat capsized. Mason Baker, 17, Will Coffin, 18, and Will&apos;s uncle, Dave Tolhurst, 54, were fishing for yellowtail near the Conch Reef Sanctuary Preservation Area in the upper Keys on Saturday when Tolhurst noticed the 22-foot boat overturned, ABC News reported. "The boat was upside down when we saw them. The captain was trying to wave us over, but we already saw him, we were already on our way," Baker told ABC 10 News. Once they got there, they saw six people in the water, with the captain of the boat trying to climb on top of his capsized vessel, Coffin said. While the boys plucked the two families from the water, Tolhurst contacted the U.S. Coast Guard. The good Samaritans pulled five of the stranded passengers from the water — including the two young children but minus the captain — onto their own boat, Coffin explained. “We definitely knew we had to get the kids out of the water first, and they were our main priority, and once we had them in the boat, then we began to take the other people out of the water,” Coffin told ABC News. The captain was able to climb on top of the capsized boat, so the teens retrieved three coolers from the water to give juice and grapes to the 4-year-old boy who was concerned that his dad, the captain, was still on top of the overturned boat in the water. Baker gave the "soaking wet" 3-month-old his shirt, and the Coast Guard arrived about 30 minutes later. The Coast Guard then airlifted the baby to a local hospital for the possible ingestion of salt water, officials said. Baker, whose father is a professional captain, said the water was choppier than predicted that day. Both families were from out of town, and the boat was fairly new, Baker said. Both boys, who will attend Florida Atlantic University in Boca Raton this fall, are planning careers in the marine industry. Baker said he plans on studying criminal justice and hopes to become an officer for the Florida Fish and Wildlife Conservation Commission. Coffin plans to major in ocean engineering. Duane Baker, Mason&apos;s father, taught him how to "respect the water" and understand the risks involved, his mother, Jill Miranda-Baker, said adding that he plans on taking his boat with him to college. "His first love is being on the water," Miranda-Baker said of her son. Members of the Coast Guard&apos;s Islamorada station credit the teens for helping to save the lives of six strangers. "The good Samaritans played a vital role. They picked the people out of the water," Petty Officer Michael Shortes said. "They called the Coast Guard and did exactly what they needed to do."